Would a homemade one be a whoopie pie? Yeah, and you should call it something crazy like..oh I don’t know, “S’mores”?! Supposedly, the Moon Pie is the original. According to legend, salesmen in the early 1900’s asked Appalachian mountain men what they would buy if they could have anything. The response was “Something with marshmallow, and as big as the Moon.” My parents used to sell Moon Pies in a candy shop when I was a kid. They definitely have a weird taste, but I’m partial to them. I prefer Mallomars, they have the same three parts, but in a different arrangement. The chocolate on Mallomars is delicious and there’s loads more marshmallow. There are also really god after a short spin in the microwave. 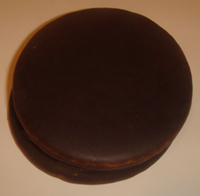 Moon Pies are better after being thrown from a float. Scooter Pies are made by the same bakery. I’m glad you said that. . .I have always been puzzled by the glorification of the moon pie because it always tastes STALE. I have only bought it in my adulthood for the nostalgia aspect. . .I offered them to my kids along with a history lesson ;-), although in truth, I don’t know anything about Moon Pies and RC colas. I would definitely go the way of homemade on these. my man!!!! moon pies NEED to be microwaved. heres what you do. get you a nice paper plate. 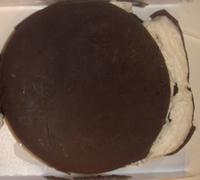 place the moon pie in the center of the paper plate. put it in the microwave for oh…. 30 secs-1 minute. keep an eye on it. when the marshmallow starts to rise up and get really poofy, then take it out and eat it with a fork and a small glass of milk. do this, then re-review the moon pie!!! it deserves justice! Who cares about these? I’ll see if I can find something like Scooter Pie or Moon Pie and try it,but these would be much better homemade. 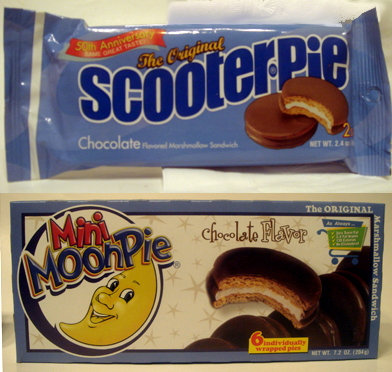 The Moon and Scooter Pie taste like cardboard! Duuuuude, please check out “Mamut Gamesa” which is the mexican alternative and bring those into the equation…i just loved Mamut growing up…now they still taste great! I never heard of either as a kid till I watched, “Laverne and Shirley.” Evidently those wacky dames loved Scooter Pies. I like both Moon Pie and Scooter Pie, but as a person in their 50’s, and an avid carb watcher, I’d vote for the S’mores, and get the chocolate bar in its solid form. Hey, I make my carbs count! I’m a former Girl Scout. Lots of nostalgia in my sugar feasts. Choco Pies are good too, especially if they are slightly frozen.